ServiceNow is a software-as-a-service (SaaS) provider of IT service management (ITSM) software, including change management. Specific change management subprocesses include change risk assessment, change scheduling, change approvals and oversight. 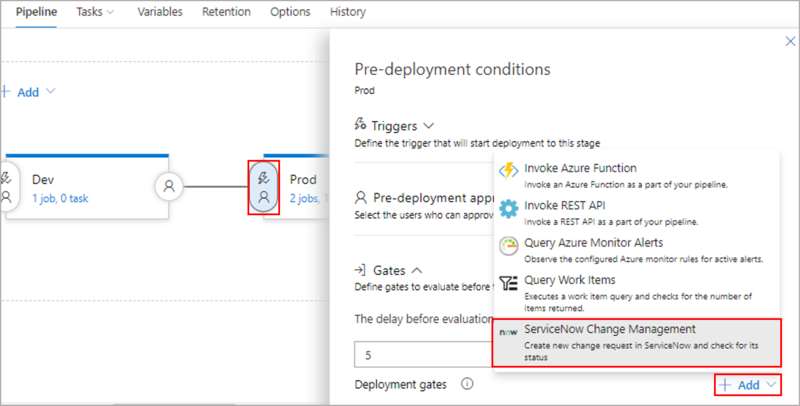 With change management, your organization can reduce the risks associated with change, while speeding up the deployments with Azure Pipelines. 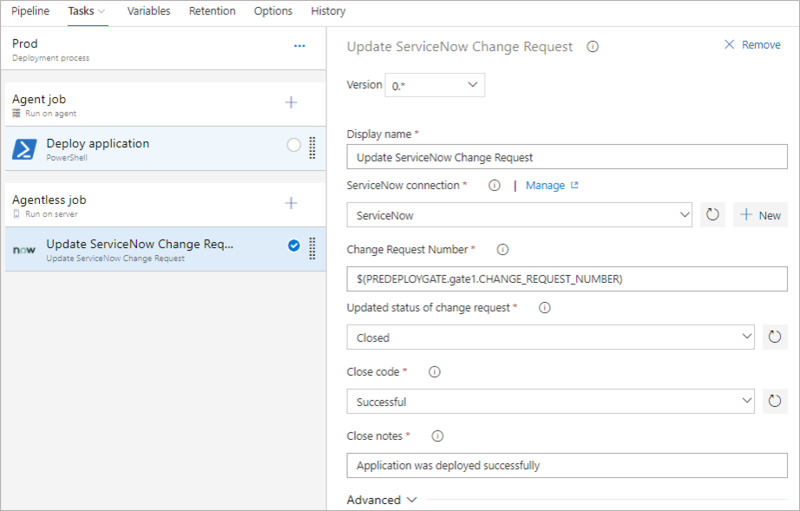 This extension enables integration of ServiceNow Change Management with Azure Pipelines. It includes a release gate to create a change request in ServiceNow and hold the pipeline till the change management process signals the implementation. An agentless task to close (update state of) the change request after the deployment is also provided. The deployment process in Azure Pipelines helps in automation of the deployment and complement the controls offered by ServiceNow. Integration requires the Azure Pipelines application to be installed on the ServiceNow instance. A service account that has been created in ServiceNow and granted the x_mioms_azpipeline.pipelinesExecution role would be used for all the communication. 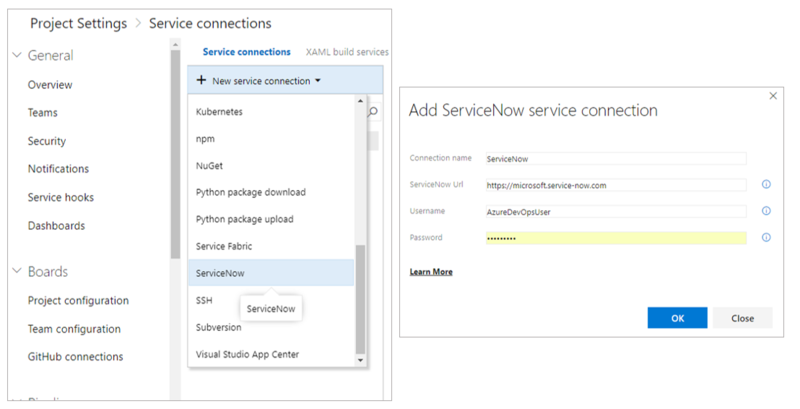 Create service connection for ServiceNow in Azure Pipelines. Provide username and password for the service account configured previously. Configure a release gate for ServiceNow Change Management. A new change request would be created for each run of the pipeline. Inputs provided in the gate would be set as properties of the change request in ServiceNow. Category: The category of the change eg. Hardware, Network, Software. Priority: Priority of the change. Impact: The effect that the change has on business. Configuration Item: Configuration item (CI) that the change applies to. Schedule of change request: Schedule of the change. Date and time should be in UTC and format should be yyyy-MM-ddTHH:mm:ssZ. eg. 2018-01-31T07:56:59Z. Additional change request parameters: Additional properties of the change request to set. Name must be field name (not label) prefixed with 'u_' eg. u_backout_plan. Value must be a valid, accepted value in ServiceNow. Invalid entries are ignored. Desired state: The gate would succeed and the pipeline continues when the change request status is same as the provided value. ServiceNow gate produces output variables. You must specify reference name to be able to use these output variables in the deployment workflow. Gate variables can be accessed by using "PREDEPLOYGATE" as a prefix. For eg. when reference name is set to 'gate1', then the change number can be obtained as $(PREDEPLOYGATE.gate1.CHANGE_REQUEST_NUMBER). CHANGE_SYSTEM_ID : SystemId of the change request created in ServiceNow. Change request number: Number of the change request that you want to update. Updated status of change request : Status of the change request that you want to update. Additional change request parameters: Additional properties of the change request to set.